Snow continued on Monday and Monday evening with 1-5 additional inches accumulating across the state (along with strong winds in the northern mountains). Thanks to this additional snow, Tuesday morning should be soft, and then the weather from Tuesday through the rest of the week looks dry. The next chance for snow should be in the January 11-12 timeframe, with chances for two storms after this, though the overall weather pattern is not conducive for consistent snow in Colorado, so we’ll need some luck for deeper totals. Moisture and storm energy crossed the state during the day on Monday and this led to snow showers during most of the day for most mountains. Accumulations were generally light, though a few mountains did pick up somewhat deeper amounts. The wind was a significant factor on Monday, especially in the northern mountains, where summit gusts were measured at and above 50mph. These strong winds closed lifts during the day. Any terrain that was not open on Monday (due to the lifts being closed) could offer fun turns on Tuesday morning thanks to the snow that was transported into these areas thanks to the wind. The water vapor satellite image on Tuesday morning shows a large storm swirling off the west coast (left side of the animation). Unfortunately for us, this storm will stall and not move much during the next 5-7 days. The blue area on the map below shows the storminess near and west of the west coast. Most of the impacts of the storm will be close to the coast, and we’ll see scraps of storm energy and moisture move through the southwest and maybe hit Colorado. On Tuesday, Wednesday, and Thursday of this week, we’ll stay dry with comfortable temperatures in the 20s and 30s along with plenty of sunshine and also some high, thin clouds filtering the sun at times. The next chance for snow will be sometime later Friday into Saturday. The forecast models do NOT provide consistent predictions when the storm energy is weak and wobbling around, so the snow potential on Friday into Saturday ranges from nothing to maybe double digits along the eastern and southern mountains. 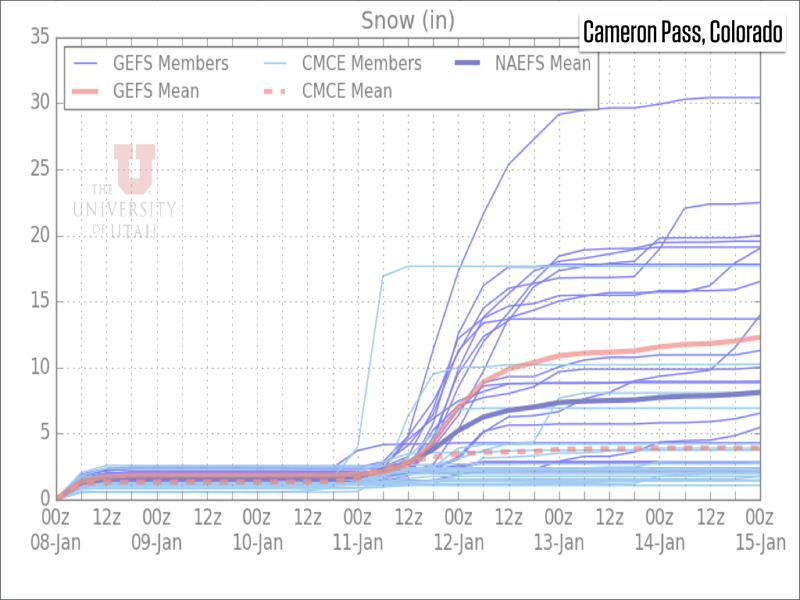 The University of Utah multi-model forecast for Cameron Pass (northeast mountains) shows anything from no snow to more than a foot. 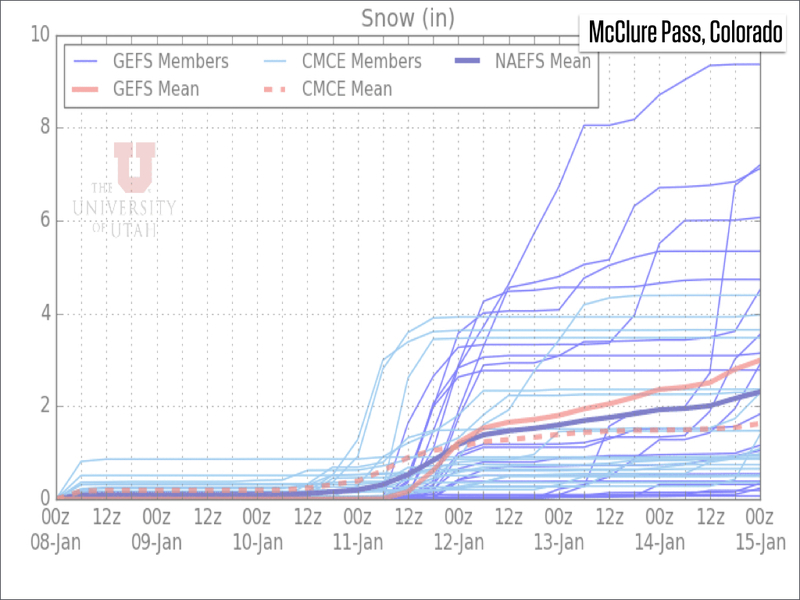 In the central mountains at McClure Pass, the forecast is more reserved, maybe just a few inches, if that. 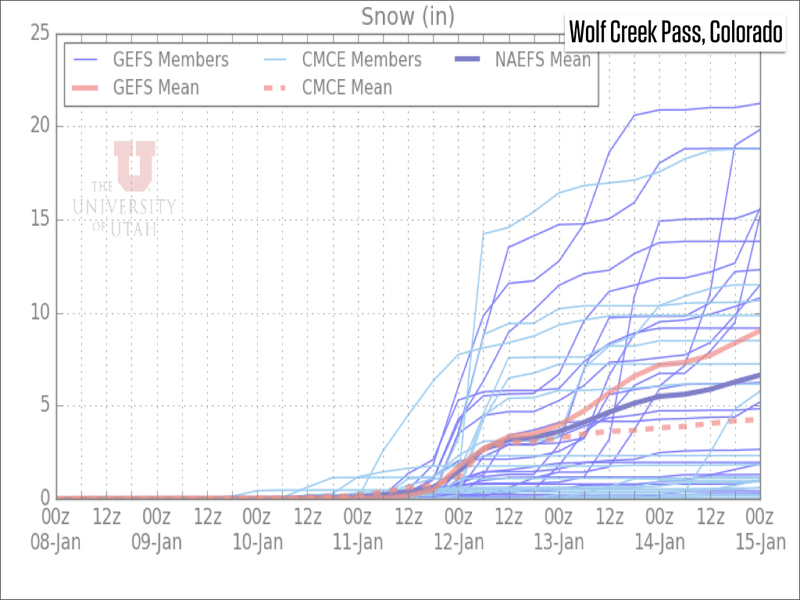 And in the southern mountain at Wolf Creek Pass, again the forecast ranges from nothing to a foot or more. At this point, I’ll keep my expectations very low and say that if we’re lucky, maybe we’ll see light snow later Friday through Saturday. Hope for the best and remember that the upcoming weather pattern is not conducive for snow here in Colorado, so we’ll need a lot of luck to get significant snow accumulations. 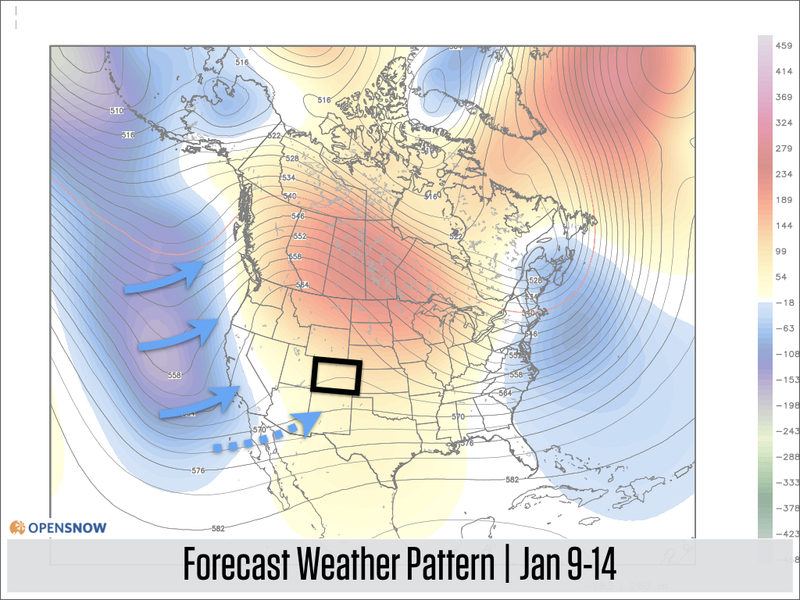 The outlook for the next 7-15 days shows the same thing that I talked about above, with the area of storminess out in the Pacific Ocean and scraps of storm energy and moisture maybe working into the Rockies every few days. Models are hinting that some of this energy could bring snow around January 14-15 and maybe again around January 19, but these are very “ish” dates and there is little consistency between the forecast models. While I am not optimistic about the chance for big storms coming up, the storm during this past Sunday and Monday is an example about how we can get lucky and see significant snow if some of the west-coast storm energy and moisture happens to track favorably near Colorado. Let’s hope this scenario happens again! My next update will be on Wednesday, January 9, 2019. I will be traveling during the next five days and should be able to post early each morning, as usual, though now and again a post might be delayed a bit. Thanks for understanding!